Built under yard no 501as a cargo- passenger vessel by Sir Raylton Dixon & Co. Ltd. at Middelsbrough for Empreza Nacional de Nav. A Vapor, at Lisbon. 15 August 1903 launched under the name ZAMBEZIA. Tonnage 1.174 gross, dim. 220.0 x 33.0ft. Powered by one triple expansion steam engine, 133 nhp. speed 9 knots. One single ended boiler with three furnaces. Engine and boiler manufactured and fitted in by N.E. Marine Eng. Co. Ltd. Sunderland. September 1903 delivered to owners. She burnt out on 13 May 1917 while lying at Lourenço Marques, loaden cased petrol, total loss, but later salved. 1920 Sold to Thesen’s SS Co., Ltd. (Thesen & Co.), Cape Town. 1931 Sold to Cia. Colonial de Navegaçao, Lisbon, renamed BUZI. 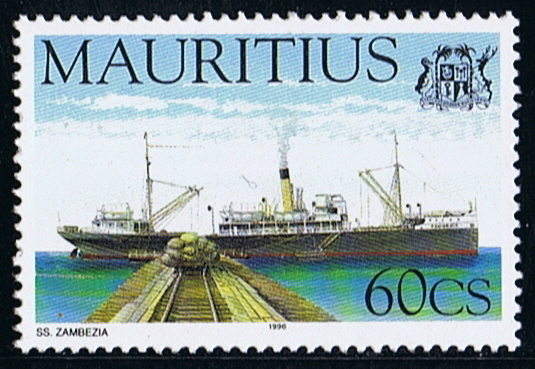 1934 Sold to Colonial Steamships Co., Ltd. (Rogers & Co.), Port Louis, Mauritius, renamed ZAMBEZIA. She was used in the service between Mauritius – Rodrigues and the Chagos Archipelago from 1934 to 1951. She was also used to carry live cattle from Vohemar, Madagascar to Mauritius. On the stamp the vessel is depict alongside the jetty at Diego Gacria, Chagos Archipelago. 1951 Sold to Karachi, where she arrived on 18 June 1951 for scrapping.